Jaguar Sharpens Its Claws: The 2016 XE Is Released For Australia. Jaguar Australia has hosted the local launch of possibly its most important model of recent times, the XE. Replacing the largely unloved X-Type and S-Type range, the aluminuim chassised, rear wheel driven, saloon will feature ground breaking levels of technology as the classic British brand prepares to take on, head on, its German based rivals. In its class, the XE will be the only vehicle to use aluminuim, predominantly, in its monocoque chassis design, with large, single stamped, panels offering increased torsional stiffness and reducing weight simultaneously. This engineering puts the XE into first place as the lightest and stiffest Jaguar released, along with being the slipperiest. Jaguar quotes a drag coefficient of just 0.26 cD. Even the suspension features aluminuim construction; the toe links and upper arms are forged aluminuim with the knuckles and lower control arms being hollow in construction. Yes, the XE eschews the conventional MacPherson strut setup, going to a double wishbone configuration. At the rear, Jaguar looked at a multilink setup, but chose instead a system called Integral Link. Jaguar has also chosen electronically assisted steering for the XE, with the computer controlled system even adjusting for ambient temperature! The cars will all hover around the near 4.7 m mark for length, 1416 mm in height, 1850 mm width (excluding mirrors), sit on a 2835 mm wheelbase and almost identical track at 1602/1603 mm front and rear. Boot space, as a result, is rated at 450 L. Underneath, the XE gets bigger brakes discs, at 350 mm and 325 mm front and rear. There’s four models in the range: Prestige, Portfolio, R-Sport and S. Each will be featuring individual design highlights; the R-Sport, for example will feature unique technical mesh fabric inserts inside and a specific exterior body styling. Powertrain wise, there will be Jaguar’s own, fully in-house developed, Ingenium range of alloy blocked diesel and petrol engines in four cylinder configuration. To kick off,the two litre diesel will offer a stupendous 430 Nm of torque and economy of 4.2L per 100 kilometres with all cars getting a 63 lire tank. Jaguar will also offer two specification levesl for a petrol engine: both will be of 2.0L and direct injection, providing a choice of 147kW/280Nm and 177kW/340Nm. Fully assembled, they’ll weigh just 138 kilograms. There will be also be the fire breathing, supercharged, 3.0L V6, with 250 kW and 450 Nm of torque, as found in the F-Type. Jaguar will make shifting gears easy, with all versions getting one transmission, a weight optimised eight speed auto. Naturally, it’s computer linked and features adaptive programming. Top speeds vary from 250 kmh for the 3.0L V6 and 177 kW four down to 228 kmh for the diesel. Part of Jaguar’s history is about being technologically advanced, showing off either classic designs or showcasing the engineering. In the XE, Jaguar debuts a world first for the brand: All Surface Progress Control. It’s a unique mix of cruise control and traction control, all for speeds between 3 and 30 kilometres per hour. Surfaces will include wet grass or snowy driveways; the driver sets the speed and the system does the rest. 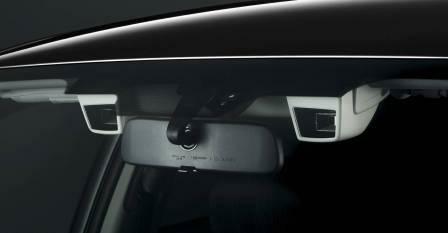 Lasers feature heavily in science fiction; Jaguar has utilised laser technology for an industry first Head Up Display. Apart from the projector being smaller and lighter than traditional HUD units, it also provides brighter, sharper imaging, with a range of information set to “float” two metres in front of the driver and additionally allows drivers that wear polarising glasses to see the image. There’s also other driver awareness technologies such as Tyre Pressure Monitoring, Autonomous Emergency Braking and Proximity Cameras (as part of the Advanced Parking Assist package). Soundwise, there’s a premium audio system packing 380W from Meridian, however it’s an odd choice to offer a DAB+ (Digital Audio Broadcast) tuner as an option, given a Mondeo Titanium or Toyota Camry has it… Pricing wise, the Prestige starts at $60400 for the entry level petrol, $62800 for the diesel and $64900 for the upper level petrol. The XE Portfolio comes with one engine, the 177 kW petrol and will see $70400 next to its name. Then, the R-Sport will have $64400, $66800 and $68900 following the same structure as the Prestige. Finally, the supercharged S at $104200 rounds out the range, with all figures being Jaguar’s Recommended Retail price. The XE range is due to go on sale in the final quarter of 2015. Contact your Jaguar dealer for a test drive. One of the many signs on the dashboard of my Volvo is flickering on and off at the moment, but I probably don’t need to worry about it. This is because I do know the real meaning (rather than the silly meanings ) of my dashboard lights and the thing that’s showing is the one for the windscreen wiper fluid. It’s only showing when I go up or down slopes, suggesting that the liquid is slopping up and down, leaving the sensor high and dry momentarily. Of course, no light on your dashboard should be ignored indefinitely and all the fluids need to be kept topped up. The last thing I want is to have my vision obscured by a lot of moth residue or a collection of marks created by (1) a bird sitting on or just above the car, (2) the cat sneaking up on said bird by way of the car roof and (3) the mess left by the bird as it takes off with the cat leaping at it. So it’s going to be top-up time very soon. The choice then will be what to use to fill the tank of window washing fluid up. And there are a lot of options! This is the easy option that a lot of us opt for. You whip down to the local automotive supplies shop and pick up a bottle of something designed for washing windscreens. Follow the instructions on the packet and there we go. The advantage of this method is that it will do the job properly and get the bugs and dirt off your windscreen with minimal effort or streaking. The disadvantage is that it’s the costliest option. If you already have a bottle of fluid designed for cleaning windows and glass around your house, you can use this for topping up your windscreen washer fluid. 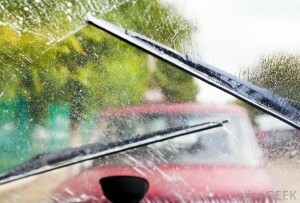 Your windscreen is glass, isn’t it? You don’t need to use this at full strength, as this will prove rather costly. Dilute it with ordinary water at a ratio of one part window cleaning fluid to two parts water. Shake well and put it into your reservoir. The advantage of this is that it will clean without streaking and it’s probably cheaper than using “proper” windscreen fluid (although it’s probably chemically identical). You can also use what you have around the home or what you can pick up at the supermarket without making a special trip to the automotive supplies shop (although there goes your excuse for paying a visit there!). This is the real El Cheapo option for those who don’t want to spend more on their cars than they have to – or who want to keep their car care budget for more exciting items. This is also what gets used by those petrol stations that helpfully provide a bucket of something slightly bubbly and a squeegee (a cross between a scrubbing brush and a wiper blade). It’s also used by those annoying roving windscreen washers who lie in wait at traffic lights trying to get a few dollars off you. It’s cheap and it washes off the bugs but it’s likely to leave a bit of streaking. Use a wee squirt of dishwashing liquid to a litre of water – just a few drops for your reservoir or you will get a windscreen covered in bubbles, which is a real nuisance. Vinegar is for the greenies out there who want to use something from a sustainable source that doesn’t produce nasty toxins. You probably don’t want to use vinegar straight, but it’s best mixed at a one-to-one ratio with water. Cheap and doesn’t streak, but may not be the most effective at cleaning off bugs, as it needs a bit more elbow grease or wiper action to work. The cheapest and the greenest option of them all. It also doesn’t streak. The only problem is that it’s not super-efficient at removing gunk off your windscreen, especially if there’s a bit of gunk or grease involved. A bit more wiper action will be needed to shift the remains of the flies if you opt for just water. In colder parts of the world, it can also freeze up. If you are in a hard water area or somewhere where the local council dumps heaps of chlorine in your tap water, you can also be left with deposits building up in the system and blocking the pipes, which results in an expensive fix. So what will I be doing? I’m still trying to decide whether I’ll use vinegar, ordinary window cleaner or dishwashing liquid, with the vinegar and the ordinary window cleaner being the two most attractive, as streaking can be a visibility hazard at the beginning and end of the day, when I’m most likely to be behind the wheel. Private Fleet Car Review: 2015 Hyundai i40 Tourer Series 2. A Wheel Thing has spent three weeks with three almost completely different Hyundai models and wraps up the trio with the Series 2 i40 Tourer with Active specification, complete with a 340 Nm, 1.7L, diesel and stylish nosejob. Straight up, the front end of the i40 Tourer brings it into line with the new family face that Hyundai are presenting to the world; there’s a definite resemblance to the sibling Sonata and forthcoming Elantra with the handsome, angular,headlights with LED driving lights and hexagonal grille. The rear, when seen directly from the rear, is also pleasing enough but in profile the rear looks heavy, too low to the ground, rather than matching the sleekness of the new front. There’s 16 inch alloys all round, with eco look tyres (the sidewalls are festooned with flowers) and they’re high profile tyres too, at 205/60. Somehow, they still manage to not look as if they fill the wheel arches. It’s an unusual look overall and reminiscent of the XF Falcon. In profile, the swage lines joining front to rear and the tapering of the windows front and rear, stand out. Overall length is 4775 mm, with height and width 1470 mm and 1815 mm. The engine,as mentioned, rolls out 340 torques, from 1750 rpm through to Hyundai’s customary 2500 rev point. It’s an astounding amount of torque and wonderfully economic. When picked up and the70L tank brimmed, the onboard computer was offering a range of over 1050 kilometres and that number barely changed, from distance covered to expected range, throughout the week, with a final economy reading of six litres per hundred. That part is simply sensational. Hyundai’s own figures are 5.1/5.9/4.7L per hundred (combined/urban/highway) . What isn’t sensational is the seven speed dual clutch transmission that has been fitted and calibrated for the i40 Tourer. Bluntly, if it were a horse, it should have been taken to the back paddock and shot. A huge gap between Reverse and Drive, an insistence on finding third and holding it on the slightest slope (requiring manual changes to give the engine the appropriate gear plus lower the din from forward of the driver), an unwillingness to offer smooth and unnoticeable changes, an ever persistent feeling that the clutches were given too much time to think about when to engage, a millennium between removing the foot from the brake and feeling forward motion…the love experienced on day one dissipated rapidly. Although the final driving experience was badly diluted, the interior more than made up for it. It’s the interior the newly released Tucson should have; classy, elegant, sweet, ergonomic, pleasurable to look at and be in. First up, the dash. It’s the dial within dials look that is found in the Santa Fe; it’s smart and it works. Then there’s the centre console; Hyundai have drawn a line down the middle and have mirror imaged the buttons, more or less. All are legible (as expected), with the plastics here (and elsewhere) of a higher quality than seen in other offerings, smart usage of visual cues (LED backlighting is widely used and sensibly employed, such as in the sliding scale look for the fan speed and temperature) and a tasteful mix of colour for the plastics (including piano black), plus the trademark sweeping arch motif from the passenger door into the dash all add up to make it a wonderful location to be in, especially with 1170 mm legroom and 1420 mm shoulder room. At the rear is a seemingly huge cargo space (576L seats up, 1672L seats down), with storage below the well carpeted covers as well. There was certainly no issue in loading up the Tourer’s cargo with kids stuff and shopping, seeming to not have enough to make it look full. There’s no power option fitted to the review car but there’s an insert in the tail gate’s plastic to indicate there could be. Rear seat room is also considerable at 850 mm. Apart from the transmission issues, it’s a pleasant, cossetting ride, with the 60 profile tyres sponging up ripples and bumps, a luxury tune suspension providing no qualms about handling except for an odd and unsettled skipping sideways on off camber turns and over bumps. The 2770 mm wheelbase and near 1600 mm tracks front and rear offer up plenty of stability. Thankfully there’s no steering mode choice, just a nicely weighted tiller and a decent level of communication between it and the front end. Brake feel was spot on, with the subconscious knowing that the pressure required resulted in the right brake setting and pedal feel. Being a torquey diesel, there was some noticeable torque steer when pressed hard into action, but not to the point it was intrusive. What it did show is how much grunt Hyundai has managed to screw out of such a relatively small engine and offer such incredible fuel economy, as a result. In profile it’s dragged down at the rear, yet that is not noticeable when seen directly. The reprofiling at the front brings it into line with its siblings and it’s a pretty face to have. The inside is just beautiful and it’s wonderfully economic. The whole package was let down by that DCT and that, for A Wheel Thing lowered the overall enjoyment considerably and had me wondering what a person that isn’t technically minded would be thinking. As the BTCC takes its annual trip to Scotland, there is never any doubt that the action will be plentiful across the weekend. As qualifying draws to an end, Priaulx has pranced his way to pole position, followed closely by team mate Tordoff. With four of the top six drivers piloting a RWD car, Knockhill makes no secrets in which cars it favours. 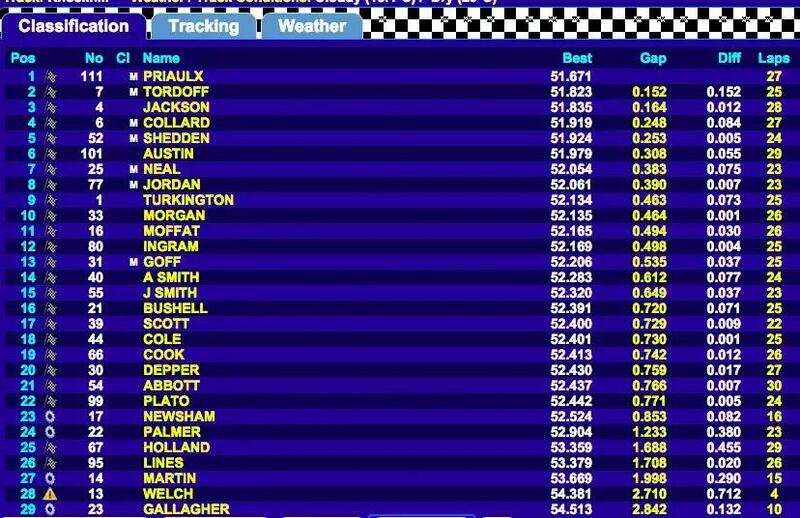 In a session that drew two red flags, for what seemed like the first time this year Team BMR were playing catchup, with Turkington their best finisher in 9th and Plato plummeting to a career worst 22nd. All eyes fell to Gordon Shedden as qualifying got under way; the Scot had dominated the first two free practice sessions. At his home circuit Flash was hoping to gain some redemption; gaining only 3 points from the 3 races at a shocking Snetterton, Shedden needed a recovery drive from the gods. The Honda has always gone well around the twisty Knockhill circuit, the same of which cannot be said of the other FWD cars. Despite the efforts of the other teams, it was BMW that would go into the weekend with the most confidence. Knockhill may well be the most physically and mentally demanding track on the BTCC calendar. 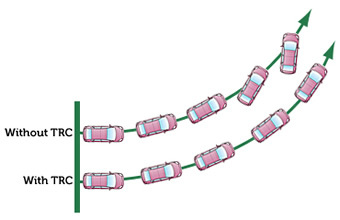 Not only does the relentless twists, turns, drops and rises put great physical strain on the driver around each lap but the short length of the circuit increases the problem of traffic exponentially. Setting a competitive qualifying time is never easy at the best of times, but this is something uniquely challenging. As qualifying began, the now weightless Ford of Jackson rocketed up to the top of the times, followed closely by Priaulx’s BMW. For the second time this year, there was not one but two red flags in the session. The first of these was caused by Jeff Smith, while the second by Matt Neal, both of whom span their way off the track and into the rough stuff. Awkwardly for the Honda team, as Neal lost control of the car and brought qualifying to its second halt, Shedden was beginning a lap that was looking good for pole. He was forced to abandon and would never come close again, settling with an eventual 5th. Now that is a team debrief I would very much like to see! Troubles continued for Team HARD and Welch Motorsport, with both suffering early exits. Gallagher would limp back to the pits after a gravel excursion, while Dan Welch suffered a collapsed suspension. Their troubled qualifying continues what has been a miserable 2015 campaign for both teams, let’s hope their luck turns soon! Speaking of changed luck, fan favourite Rob Austin qualified 6th; it is no wonder he enjoys the track so much! It was the final 5 minute flurry for positions that produced the most action. It was almost like somewhere in the WSR garage, the team went into DEFCON 1. As the seconds ticked away, Priaulx stormed to the top of the times, followed closely by Tordoff, while Collard managed 4th. Frustratingly for Jackson, had his fastest lap not been disallowed due to exceeding track limits, he would have been sitting on pole. In a shocking turn of events, the usually meteoric BMR team were struggling to keep pace with the rest of the field. As with the MG team last year, they may well be the best FWD car but the challenging Knockhill circuit does not suit them at all. The best they could manage was Turkington who qualified 9th. In what must be his worst qualifying session of his entire career, it was Plato that has stolen the headlines for all the wrong reasons. Whether it was due to the traffic and session stoppages, the best Plato could manage was 22nd, a whopping 0.771 seconds off the pole time. You may be thinking that 0.7 seconds is not that much of a gap; in any other motor sport series you would probably be right. 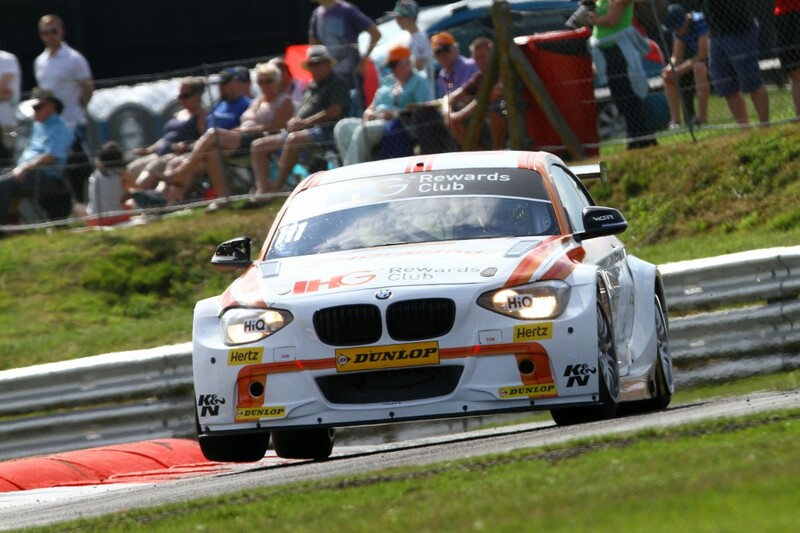 But this is the BTCC; there is a reason why it is the best tin top series in the world. If it is proof you want then how about this; take a look at the top 23, they are all covered by less than a second. It has come to the point where I must make my predictions for race day. I often have a pretty good idea what will happen, but not this time. I imagine the BMWs will secure at least one victory, but no one can discount Jackson in his Ford rocket ship. Furthermore, with Plato starting so far down, will he decide to start from the pit lane to secure pole for race two? But with the handicap of driving a FWD car, will such a strategy even work? Turkington has always enjoyed Knockhill, and fresh off his victories last year will be hungry for points. As ever, there are so many ‘what ifs’ that it is impossible to call with confidence. Weight and uphill power are not a amicable combination. With Knockhill providing more drops and rises than any other circuit on the calendar, success ballast may play a fascinating role in proceedings tomorrow. At the end of the day, at the same venue of his first ever BTCC win, if my money was on anyone it would have to be Priaulx. But with a field so close together, the only way to know what will happen will be to watch the races. Qualifying at Knockhill today has been nothing short of a testament to the high quality of the BTCC; low costs but highly entertaining and fiercley competitive. Nothing makes motor sport more fascinating to watch than the driving force of unpredictability. Unlike traditional sports, racing is the combination of man and machine. Both must be working at optimum performance to achieve results – but sometimes mechanical malfunctions can strike when you least expect it. Above all of this, looming above like the very essence of chaos itself, is the weather. 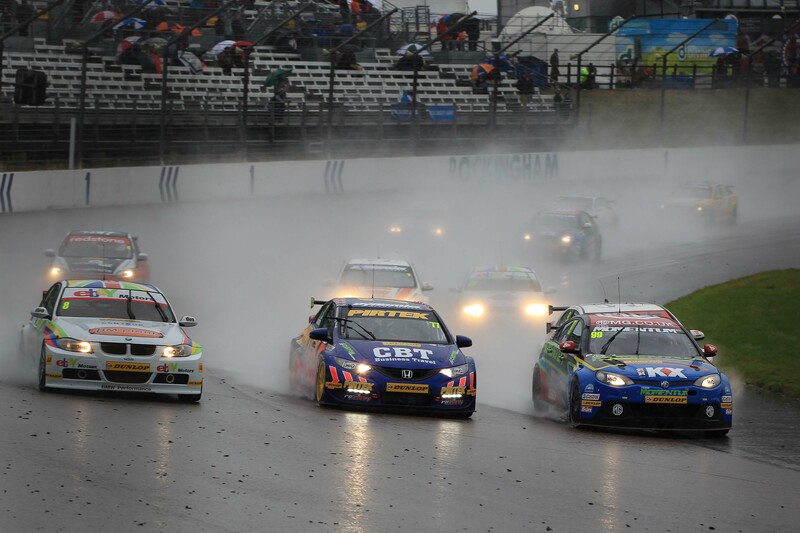 Within the BTCC, some of the greatest battles have taken place when the weather turns sour. From rain masters to the perfect plan, the weather is truly a great leveller. 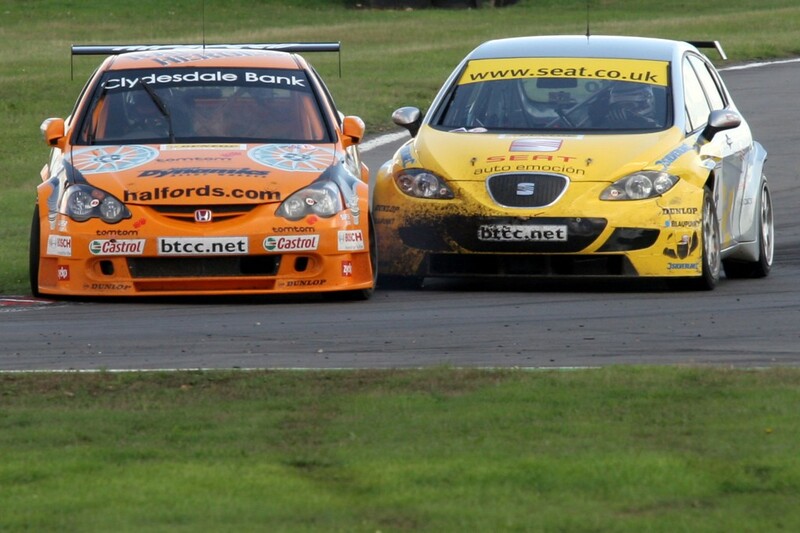 By delving into the glorious BTCC past, we can now see why. If I was to name every occasion where rain played a part in an amazing race, I would be here for a lifetime. Therefore I have decided to condense these down into what I would like to call my ‘greatest hits’. The first of these comes in 1993 and the first appearance of Renault in the BTCC. Running the Renault 19, reigning champion Tim Harvey and a young Swiss gentleman by the name of Alain Menu. Most of the ’93 season was dominated by either BMW or Ford, until it started raining that is. Tim Harvey and Alain Menu took a blistering 1-2 at the first Donington meeting of the year. In dry conditions, the Renault team struggled to keep pace with even the privateer teams. But Renault’s secret weapon was their wet Michelin tyres, which was far superior to any other. Later on that year when the championship returned to Donington, history repeated itself as Menu and Harvey found themselves in the podium positions once again, although this time challenged more fiercely by the dominant Ford of Radisich. 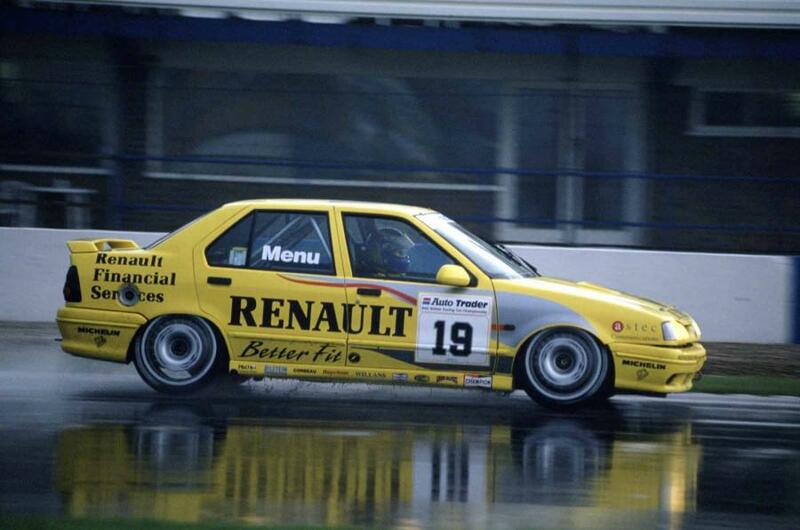 Throughout the rest of his BTCC career, Harvey established himself as somewhat of a rain master. When he drove for the Peugeot team, some of their best results came when the rain began to fall. It takes a special kind of skill to control a car in wet conditions, let alone drive it quickly! Whenever you read any of the old pre-season reviews, the championship chances for Harvey were almost always the same. If it rained at every meeting then the title was guaranteed to be his! Considering this was the BRITISH Touring Car Championship, that was never going to be completely out the question. Alas, this never did happen so Harvey had to stick with his single championship title from 1992 in the BMW. Fast forward to 1995 and we come to one of my favourite moments in BTCC history. I am of course talking about ‘The Amazing Charlie Cox’. When a last minute rain storm struck Brands Hatch, the field was torn between intermediate and full wet tyres. Cox chose to put on full wets, subsequently scoring the best ever result for a privateer in the championship’s history. Driving around the struggling intermediate drivers, Cox ended the race in 5th. As championship contenders dropped like flies, the rain and clever thinking allowed Cox to battle with the big boys at the top end. In 1998, we would once again see a manufacturer who’s performance would usually see them trailing boosted by the rain. Since their epic return to the championship in 1993, Ford has somewhat wilted. Enter a rainy Silverstone and the ever competitive Will Hoy however and suddenly everything came together. Clever tyre choices and strategic pit stops put Hoy into a lead that he would never lose. Who can also forget what I once dubbed as the Greatest Race Ever Captured On Film, when Nigel Mansell returned to the BTCC in a Ford, starting last and so very nearly winning the race outright. In the dry, there is no chance in the living memory of the earth itself that Mansell could have pulled that off; the Ford lacked the basic performance of the big names such as Nissan and Volvo. Finally we must return to the legend that is Will Hoy. For a driver of his quality in the BTCC, it’s just not right to only mention him once. For his final foray into the BTCC, Hoy took over from Russell Spence in the independent Renault Laguna in 1999. During the final round of the year, a rather damp Silverstone saw Hoy having a truly epic battle with the likes of Neal, Cleland, Muller and Radermecker. It was clear that the Renault was severely down on power, but slippery conditions require more than just superior power. 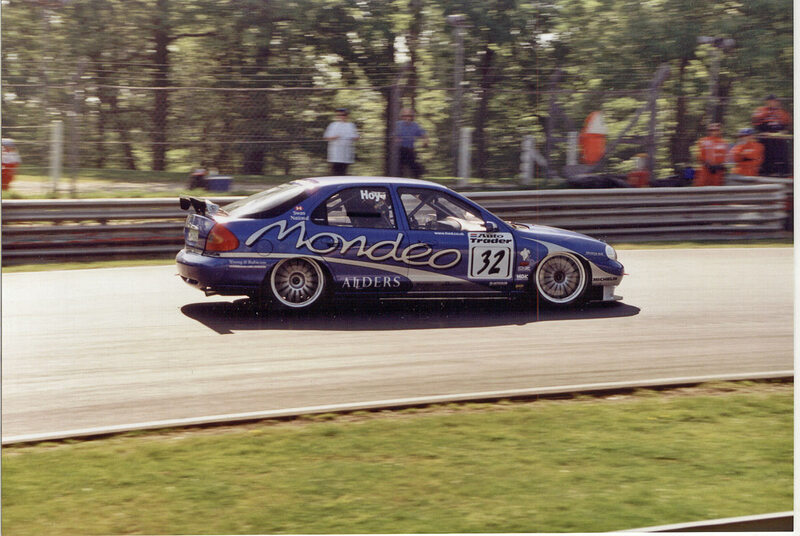 In 1999, for me Will Hoy was the Unsung Hero of the BTCC. If I knew nothing else that would be enough; the proof of a true driving great is to do exactly what Hoy did. He could drive the pants off a car in the dry, while also storming (see what I did there?) to victory in the wet in an inferior machine. What I love about the weather is that it cannot really be controlled, unlike most other aspects of the race. Furthermore, you could very easily have the best car, but if you do not have that confidence and skill in the rain, all that power and performance will be for nothing. In many ways, a change in weather really does level the playing field. It is why I always look forward to the final round of the year at Brands Hatch; it always rains. And you can guarantee nothing but spectacular racing. Until next time, keep those rain clouds forming! Once upon a time, dogs trotted alongside whatever form of transport we humans used quite happily, as dogs and horses had similar levels of stamina. A few lucky dogs got to ride inside the cart or coach, while other dogs (e.g. Rottweilers) got to pull the cart personally. Dogs also famously provided the grunt for the sleds that conquered the South Pole. Some dogs still do act as the motive power of transport – just ask all the people who drive dog sleds in the Iditarod race in Alaska. Fast forward to today. We still like to have our four-footed family members coming with us on outings. Some people need to take dogs with them for work purposes (cops and farmers). But is it just a case of simply popping Rover in the Rover? Or is it more complex than that? We all know that it’s important to wear our seatbelts (don’t we???) and that the whole point of seat belts is to stop you flying forward and exiting via the windscreen in the case of a sudden stop. The laws of physics apply to our canine friends as well, of course. 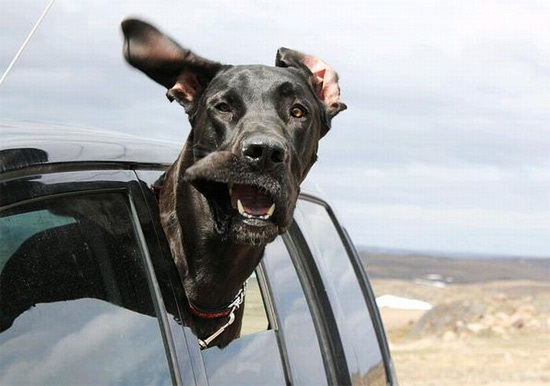 Dogs can indeed go flying forward in an emergency stop, the same as humans will. So the logic says that a dog ought to wear a seat belt. The trouble is that the canine anatomy is not suited to seats or to seat belts. What’s more, dogs come in a much larger range of sizes than humans do. 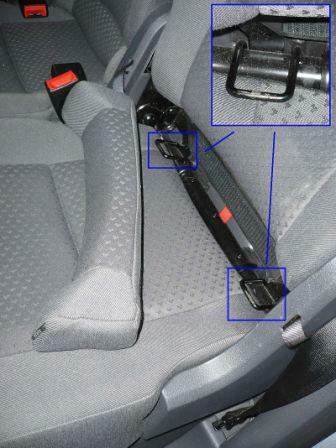 This means that the standard seat belt provided in the typical car won’t do the job. It might not fit your St Bernard (or Chihuahua) and putting on the Labrador might throw your dog’s limbs out. You can buy doggy seat belts to solve this problem. 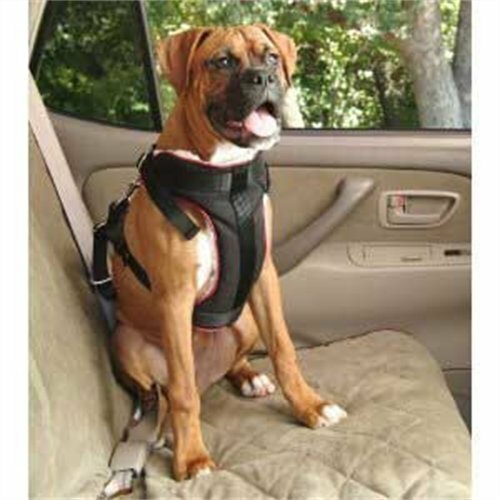 These consist of a sort of chest harness thing to go around the dog while the seat belt clips into this. These work pretty well and will secure your dog. They’re not the only option, so if you’d rather not have your dog sitting on the leather seats of your car (their nails will scratch the leather) or if your dog is too darn big to sit comfortably on the seat in a position that allows the seat belt to be used, then you don’t have to use this method of restraint. But you still have to make sure that your dog is safe in the case of a crash. In fact, the law in many states says you have to. It does vary from state to state, but in Western Australia and New South Wales, it’s illegal to have an unrestrained dog in the car, especially if said dog is on your lap or interferes with your ability to drive safely. If your dog is small enough to fit there and your state permits it, you can encourage him or her to sit in the footwell behind the driver or front passenger seat. The other alternative is to pop the dog into the boot area of a hatchback or stationwagon – and to install a safety net that stops things flying forward. Again, the boot is probably best for a massive dog, while the footwell suits smaller dogs of about bull terrier size downwards. The third option is the carrying cage. 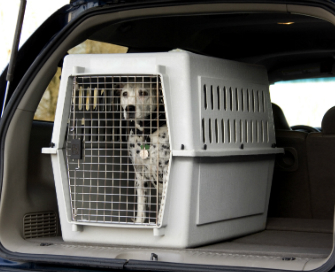 A lot of people who own dogs and 4x4s have a carrying cage in the back of the 4×4 specially for the dog that allows the dog to see out of the back while keeping it safe. Not a bad option, really. I know your dog loves to stick his/her head out of the window while you’re travelling. This may have to stop, however, unless the doggy seatbelt permits this. Utes are a different story again. The law also has something to say about what you can and can’t do with a dog in the tray of a ute or similar vehicle. The dog has to be restrained so that it can’t jump or fall off. This means either a cage or box, or a short leash. Notice the word “short” in that sentence. A dog shouldn’t be on a leash that’s long enough to allow it to get off the sides of the ute. Oddly enough, the law (in South Australia, anyway) says that if a farm dog can be loose on a ute deck if it’s just about to, in the middle of or just finished moving livestock along the road. The other thing that has to be said about dogs in cars is what you should and shouldn’t do when the vehicle has stopped and you have to get out of the car. Sometimes, you can’t take the dog with you where you’re going (e.g. the shops or into church). Now, the RSPCA gets very angry (and rightly so) about dogs being left in hot cars. This really is animal cruelty. Dogs have a naturally higher body temperature than humans (some scientists suggest that this is how certain breeds of lapdog came about – they were bred to be living hot water bottles). They also can’t sweat to cool off and rely on panting instead. This means that the surrounding air temperature has to be cooler than the dog. Now, we know about how hot can get inside a car and that you can melt cheese and chocolate on the dashboard. If you leave your dog inside a car with all the windows closed up, you will slowly cook your dog alive. Shocking but true. Doing it right on the back of a ute. If you can’t take your dog with you, you’ll have to ensure that your dog stays safely cool. This may involve removing the dog from the car and tethering him/her somewhere safe outside the car. The other alternative is to park in the shade and leave the windows down a little to allow fresh cool air into the car. Obviously, you shouldn’t leave the windows down far enough to allow the dog to wriggle or jump out. This will compromise your car security, but a thief is less likely to try breaking into a vehicle that has a yappy terrier kicking up a fuss inside it… Double that if the dog is a bull terrier or Alsatian. Better still, plan your trip so that you don’t have to leave your dog in the car! In all cases, it’s always wise to make sure that your dog and your vehicle suit each other. This means that if you have your heart set on a Great Dane, it might be time to say goodbye to your little Fiat 500 and look for a larger vehicle. Zen and the Art of Safety. What’s the first thing on your mind when you get into your car? Kids? Problems with the spouse? The long drive to work because of traffic? It’s fair to say that no thought is given to having a safe drive, because we just expect that we’ll get where ever we’re going without a problem, because we know we have a safe car. What’s in our cars that relates to safety? Let’s check out some of the terms we get thrown at us by the good folk that are tasked with helping you buy your new car. ABS. 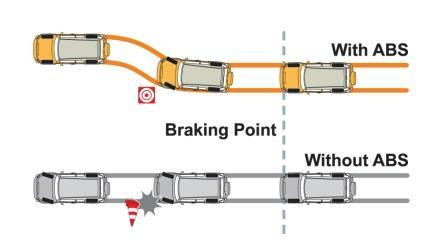 Anti lock Braking System. Possibly the most common and certainly one that’s been with us for some time. In this case, the name pretty much describes what they do. Hit the brake pedal, hard, you’ll feel a mild pulsation through the pedal, that’s the system grabbing and releasing the brakes, possibly up to 15 times per second. Let’s consider, for argument’s sake, a 1985 Corolla; you’d flatten the brake pedal, the brake pads would bite the brake discs and the wheels would lock, stopping rotation and control of the car. ABS allows a driver to steer out of a situation as the wheels haven’t locked up and possibly avoiding major contact. The caveat here is that ABS works just fine on tarmac, dry tarmac preferably. If you were to take an ABS equipped car off road and into gravel, for example, then you’d more than likely find the car would take longer to stop, however manufacturers would calibrate off road vehicles for this. ESC. Electronic Stability Control. In essence, ESC is an evolution of ABS, in that sensors measure brake pressure, the angle of the car (forward and sideways) then applies brake pressure to the wheels the system has determined needs more and decreases when not required. It’s sometimes felt when a car is going into a turn too hard and the car is “forced” to slow and straighten up, with the system possibly programmed to reduce engine power to reduce traction further. ESC is also known as ESP (Electronic Stability Program) or DSC (Dynamic Stability Control). Part of these systems is Traction Control, where, for example, a driver could accelerate hard from a standing start, with the system sensing that too much power and torque is being applied, causing the tyres to spin and will then shut down the level of power in order to stop that spinning. SRS Airbags. Supplementary Restraint System Airbags. The key word here is “Supplementary”; the onus is and should always be on the driver to be in control of their driving style. A SRS Airbag setup complements the seats belts that a driver, passengers, should be wearing, however, should their be an impact, a sensor reads that and fires a small explosive charge that inflates, very quickly, a bag made of fabric. Initially, airbags were fitted to the steering wheel and in a pocket in front of the passenger. 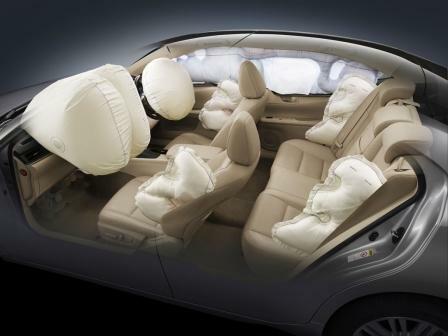 Now we have seat airbags, located in the lining of the front seats; curtain airbags, mounted along the curve of the roof inside the lining and above the passengers, which then floods down to the window line. There’s even knee and thorax airbags with one company discussing seat belt airbags. Airbags are designed to help reduce the impact of the human body on the inside of the car; in some countries where seat belts are not as rigidly enforced for usage, the ‘bags fire quicker to compensate. EBA. Emergency Brake Assist. 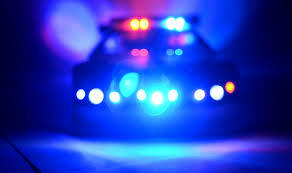 Some drivers may be too timid or physically unable to push the brake pedal as hard as needed in an emergency situation. Sensors will measure the brake pedal input against other readings and make apply a higher force of braking than the driver has applied. EBD (Emergency Brake Distribution) then may be called upon; this redistributes, as required, braking force to each wheel by apportioning pressure to the wheel most in need of extra braking pressure in order to help stabilise the car. EuroNCAP. Euro New Car Assessment program. This is nothing more than a series of tests, mainly involving crash testing, to determine the structural strength of a car and how it combines with crumple zones, the airbags and more, in order to determine the safety rating of the vehicle in question. In Australia, the aim is to have a vehicle reach a star rating of five, the highest possible under current guidelines. ISOFix. Most cars sourced from overseas have a new (to Australia) method of mounting a child seat. Where a system of strapping via seatbelts would be used, ISOFix is a latching system where metal rods will lock on to clips mounted in the creaseline of the rear seats. They’re designed to hold up to 30 kilos of total weight, ensuring the highest possible safety factor for your child. HUD. Head Up Display. Possible more familiar for those that follow military technology but the concept is exactly the same; a screen is built into the dash in front of the driver and reflected into the windscreen. 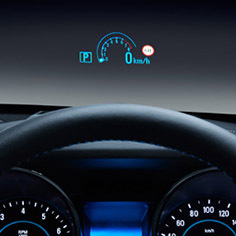 Information such as speed, fuel level, G forces, fuel range can be displayed at the touch of a button, with some companies including speed zones and alerts. It’s surprisingly useful and is designed to be non distracting to the driver. ICC. Intelligent Cruise Control. Also known as Adaptive Cruise Control. This is becoming more and more visible, trickling down from the luxury vehicles to more mainstream cars. Normal cruise control simply locks in a preset speed and keeps the car at that, regardless of road conditions and traffic. Intelligent cruise control uses a radar system, mounted either in the front grille or in a housing where the rear vision mirror mounts to the inside of the windscreen. By measuring the distance between your car and the one in front, it will then keep your car not only at the predetermined speed but at a predetermined distance (either by time or by metres) from the vehicle ahead. All will slow the vehicle should that car ahead slow and most will bring your car to a complete stop as well, with some requiring human input to recommence forward motion. All of these systems should be considered supplementary, as you, the driver, should be aware of your car’s condition, the road conditions, other drivers, at all times. Extra driver training courses are available and will cover levels from a new driver to more experienced drivers that wish to be refreshed on their own capabilities. 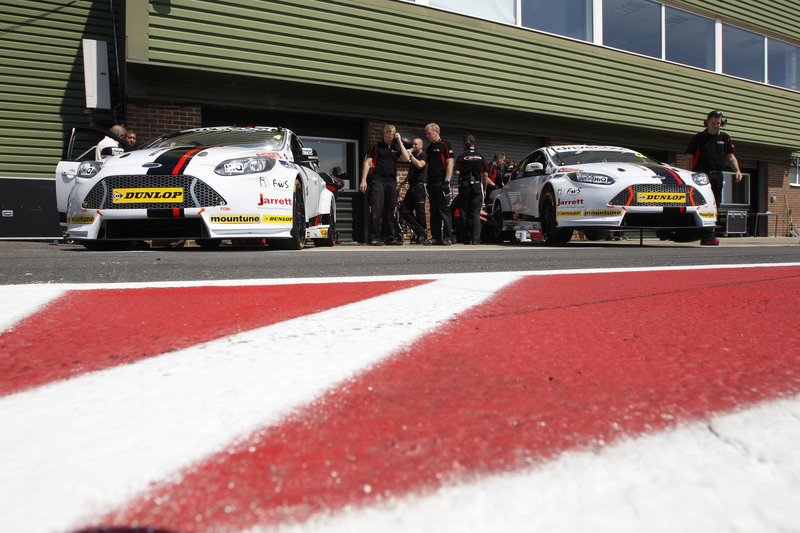 Since the start of the 2015 BTCC season, there has been a significant increase in talks regarding driving standards. Not a weekend goes by without multiple drivers making reference to questionable incidents and the quality of driving within the field. Many may think that comments like these exist as nothing more than excuses to explain away a disappointing race. As true as this may be on occasion, on the whole these comments do present an important question. Talk of ‘push to pass’ tactics may have escalated in the last few years, but many years ago an oracle spoke unto us all. His words, laced in brutal Brodie flavoured honesty, spoke of what may well have been the dawning of a new era: the demise of driving standards in British saloon car racing. Little did Smith know that his thoughts echoed those of an oracle from long ago. An oracle who for many may have been forgotten in the deep chasm of time. But his words from the past ring out now more than ever. At the time it may have come across like nothing more than an angry outburst, but this was something bigger. His passionate speech may have predicted what was to come. Throughout the 2000s, the BTCC may have inadvertantly given itself a bad name, considering the rise of the ‘push to pass’ technique of racing. After the drama of Snetterton, Jordan admitted that a team can do a great deal to make a car competitive, but it really is rather difficult to engineer a car to be hit from behind. Well, unless of course you take a leaf out of Volvo’s book from 1994 when they ran their infamous Estate; a true Titanic of the touring car field! Mention of the BTCC should not immediately jump to criticisms about driving standards and crashing. 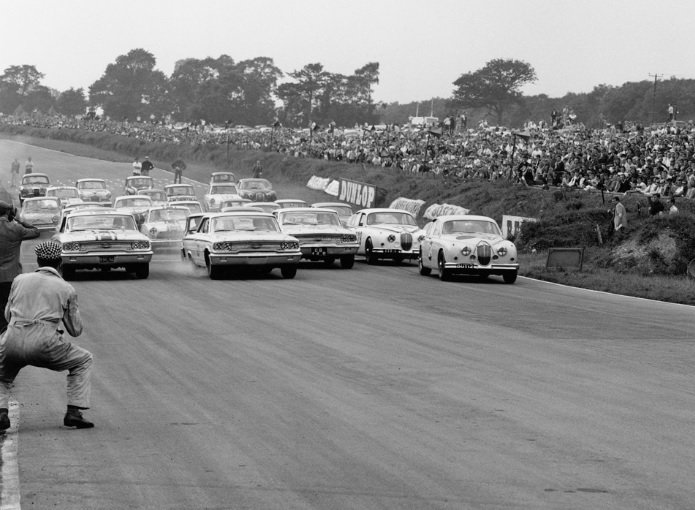 The BTCC evolved from what was the British Saloon Car Championship which was born out of the true roots of motor sport. The series used find its value on great clean racing and gentleman drivers. None of the celebrity culture from the modern era, just a group of people who wanted to do what they loved – race cars. Say what you like, but back in the day cars could be driven home after the race, not something that would be possible given the post-race state of many cars today! This speech by Brodie touches on multiple points that highlights just how much the championship has changed from its early days. In the pursuit for glory, development through spending was always an inevitability. Even in the late 1980s, the Ford manufacturer support helped propel Soper to so much success in the Eggenberger Sierra. By 1989, Brodie was one of the few Class A competitors who was still a private entry. Fast forward 10 years and the spiralling costs of the sport force many teams to leave the championship. By 2000, Renault, Nissan and Volvo had all left, leaving only Ford, Honda and Vauxhall. This was the year when Ford reportedly spent £17 million on their championship effort. And then of course we get on to the drivers themselves, many of whom by the 90s were all paid drivers from the F1 scene (Tarquini, Warwick and Jean-Christophe Boullion to name but a few). The focus on racing had shifted to sponsorship deals and the size of your motor home (take that one how you will). The increasing popularity of the sport culminated in the evolution of ‘the celebrity’ within the series; thousands of fans cheering you on and queuing for hours to get your autograph. Driver status seemed to be dominated by money and popularity. On the talk of popularity, many people only remember those who drive dirty, which in many ways promoted the decline of decent driving standards. Even now the costs of entering the sport are capped, the remnants of the past still remain. I have always said that the Giovanardi era of the BTCC was painful to watch as a fan; no pass could be completed without someone ending up in the gravel. For me to describe any race driver as great, one must be able to complete an overtake cleanly, however close it may be. Contact will sometimes be inevitable, but not all the time. Rubbing may be racing, but when rubbing becomes thumping, something is wrong. Brodie had it right, as did Smith – its truly pitiful and diabolical. Most importantly, what kind of impression is that having on the public? As fans, we look up to these drivers as our heroes. Should they really be promoting such behaviour on the road, racing or otherwise? Of course there are drivers who are not as I am describing – just in the same way as Brodie gave Andy Rouse an exception. As long as the majority are proper race drivers, then hope remains. Its when the bad habits catch on that trouble starts. It seems strange that so many drivers now complain about driving standards, yet nothing seems to be changing. The issue may be that they can be used as an excuse so easily, as well as the fact that people can get away with it so easily! With such a focus on these bad driving standards, we can hope that things start to improve without having to impose harsh penalty systems into races. The past is always in the present; if these drivers look back to their heritage they may learn something now. The last thing we want is to give BTCC a bad name. What Brodie said in 1989 was right – the focus should be racing, not the celebrity status or the money. And we are moving in the right direction, but more needs to be done. We need to set a good impression for the thousands of fans out there! Until next time, keep driving people! I’m Getting A Ticket For What??? I’m sure that the powers that be for traffic control have a quota system going. There can’t be any other explanation for it. Why else would they hand out tickets for tiny little things seemingly at random? Why else would the people who do the roadworthiness tests fail vehicles for teeny little things? Why else would the drivers’ licence testing people fail people for very, very minor issues – which may have nothing to do with the driving? You know perfectly well that on other days, there would be no problem at all. Blame Key Performance Indicators and all that management hooey. Traffic cops, inspectors and testers have to be Seen To Be Doing Their Job, which means that they have to find something to fail or ticket to justify their jobs. I kind of understand this, as when I’m not having fun writing driving-related blogs, I work as a proofreader; picking out a missing full stop or a typo the spell-checker missed shows the client that I actually did do some work. The difference, however, is that my clients want error-free reports and research papers, so are happy to get barely noticeable typos picked up, whereas nobody wants to be ticketed or failed. The cop who ticketed an elderly woman for “driving without her seatbelt” because she had turned the engine on before putting her seatbelt on (to warm up the engine of her little old hatchback on a cold winter’s day, naturally). A teenager sitting their provisional licence test who failed because he didn’t stop for “long enough” at a stop sign, even though the road was quiet. Another teenager who turned up to the licence test in a farm vehicle that smelt of dogs and substances on the bottom of gumboots even after having a good clean out (said teenager had come into town from rural area, as this was the only place to sit the test). Squeamish townie tester decided the car wasn’t in adequate condition for the test = fail. The cop who gave my other half a ticket for driving too slowly while towing a heavily loaded trailer. This happened not too far away from a road packed with those billboards warning people about excess speed. My friend’s car failed a roadworthiness test because of a bit of stick-on window tint that was deemed to be “too dark” and obscuring the driver’s vision… although it was on a rear window more or less in the driver’s blind spot and had been applied to keep my friend’s red-haired, pale-skinned little kids out of the strong summer sunlight. The cop who we saw coming the other direction but, after we had gone past, decided to turn around and follow us for the next 20 or so kilometres until the other half’s attention went off the speedo for a few seconds and the Volvo crept over the speed limit. Actual quote from said cop: “You weren’t going much over the limit when I clocked you but I could tell that you were going to go faster.” What – do they fit cop cars out with crystal balls as well as speed cameras these days? So here’s your chance to have a bit of a rant. What teeny little things did you get pulled up and fined for or failed for? Tell us about them (but please keep names and easily identified places out of it or we might be looking at lawsuits and we’d rather not have the hassle).